NEW YORK - Halfway into a listening session for Beyoncé's new album, "I Am . . . Sasha Fierce," a publicist at the Columbia Records office hands me a promo packet. "On the first page, you'll see a photo of Beyoncé," she says of a sweet image of the singer wearing little makeup and an au naturel glow. "Turn it over, and you'll see Sasha Fierce," she adds. Sasha Fierce is the kind of hellcat you'd run into in a dark alley at midnight, on her way to dancing in a cage at a three-story nightclub. She's got raccoon eyes, 6-inch leather stilettos, and a creepy metal glove used for who knows what. You have to wonder: Who is this Sasha Fierce, and why did Beyoncé need to create her for this new double-disc concept album that's out tomorrow? The beauty of Beyoncé Knowles is that she's a blank slate - a chameleon, if you're feeling generous - who becomes whatever we want her to be depending on the outfit, the hairstyle, the song, the beat. She's an exceptionally gifted and largely wholesome pop star with a good voice, better instincts, and a catalog of hits first from Destiny's Child and now as a solo artist. Since Destiny's Child, she's been dogged by the perception that she's a fabricated pop star. With "I Am . . . Sasha Fierce," her third solo album, Beyoncé finally asserts herself and wants us to know she's in the driver's seat, even if she's steering two cars at different speeds. She's still indebted to her bold-face producers (uber-hitmaker Rodney "Darkchild" Jerkins) and co-writers (Ryan Tedder, the OneRepublic frontman responsible for Leona Lewis's massive hit, "Bleeding Love"), but this is supposed to be Beyoncé's big statement. For the most part, it works well and sounds fresh. The first two singles - the contemplative ballad "If I Were a Boy" and bachelorette-party battle cry "Single Ladies (Put a Ring on It)" - each come from a different disc, and that's how the rest of the album will be marketed. For every tearjerker, you'll get a tricked-out club banger to drag you out on the dance floor. The ellipsis in the album title serves a purpose: a clear distinction between the sincere singer we hear on the first disc and the wild woman on the second one. "I Am . . ." represents the Beyoncé we think we know - more personal (she co-wrote five of the six songs), heavy on ballads, heart on sleeve. "Sasha Fierce" introduces us to her alter ego who says and does things Beyoncé the good girl wouldn't dare to consider: "What? You want me naked/ If you likin' this position, you can tape it," she coos on "Video Phone" in an accent that's part Long Island, part Barbados. It's certainly not the first time a singer has had dueling personas. Country star Garth Brooks flopped with Chris Gaines, his alt-rock doppelganger, back in 1999, and rapper T.I. skewed fact and fiction on last year's "T.I. vs. T.I.P." This new Sasha Fierce character is more in synch with Beyoncé's latest ambitions, including a starring role as Etta James, the original hellcat, in the upcoming movie "Cadillac Records." Most important, though, "I Am . 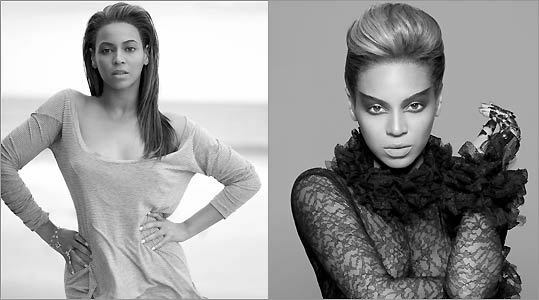 . . Sasha Fierce" is Beyoncé's way of towering one high heel above her peers in a marketplace where street cred is just as important as designer beats. You'd be forgiven for thinking "Radio" is the latest electro-pop confection from Rihanna. It's fun and bouncy, with a sneering attitude - perfect for a night at the club. "Diva," the female counterpoint to rapper Lil Wayne's herky-jerky "A Milli," is a glitchy, bass- heavy thumper with the most ridiculous chorus of the year: "Now diva is the female version of a hustla" (does Barbra Streisand know this?). It's insanely catchy, but then, when you hear something looped incessantly, no matter how mindless, it's bound to stick. The next single from the first disc is "Halo," by far the most evocative power ballad Beyoncé has ever recorded. It's a hulking, epic love song that sounds like it has Phil Spector working his Wall of Sound magic on the mixing board. Never mind the garden-variety lyrics; this one is all about build-up, starting with a pre-chorus that climaxes with Beyoncé's voice ricocheting the word "halo." She sounds comfortable, if a bit too earnest, on the ballads. "Disappear," a slow jam that's more pop than R&B, features some of Beyoncé's most controlled yet effective singing amid a swirl of harmonies. It's hard to remember her ever sounding this dreamy. The standard edition of "I Am . . . Sasha Fierce" has just 11 songs, but still there's extra baggage. "Ave Maria," which riffs on the traditional song, is an intriguing proposition torpedoed by a soggy arrangement. "Satellites" leads Beyoncé into "American Idol" territory, with yearning lyrics usually reserved for epiphanies in Broadway musicals. Some of the album's bigger gambles are available only on the deluxe version. "That's Why You're Beautiful," from disc one, is a flash of something shiny and new, a neo-soul gem from the Jill Scott playbook. As a guitar plucks out a minor-chord counter melody against stuttering drums, Beyoncé's phrasing goes against both. It's bizarre, refreshing - and probably won't be coming to Top 40 radio near you. Only on "Scared of Lonely," another bonus track, do Beyoncé's split personalities seem to overlap. It's supposed to be the confident Sasha Fierce who's narrating, but she's singing sentiments that seem very unlike her: "I try to be patient/ But I'm hurting deep inside/ And I can't keep waiting/ I need comfort late at night." Maybe Sasha isn't so fierce after all. Or perhaps she's just like the superstar who created her: a woman of fascinating contradictions who's getting closer to finding her true self.